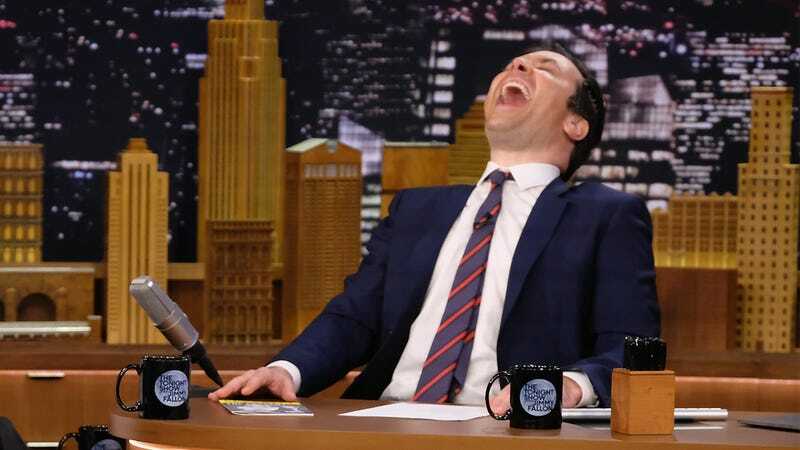 It seems like one of late night’s most celebrated hosts may have let his fame and fortune go straight to his head: Last night, a cackling Jimmy Fallon gloated to viewers that he held a Scrubs reunion without anybody around just for his own personal amusement. Jesus Christ. Jimmy Fallon has become completely corrupted by power. Now we are all just pawns in his cruel little games. Shortly after completing a string of monologue jokes at the top of his show, a sneering Fallon looked out at the studio audience and asked, “So, are there any Scrubs fans in the audience tonight?” Crowd members began to cheer as a visibly giddy Fallon began rubbing his hands together and said, “Well, I have some news for you: Last night, I had the entire cast of Scrubs over to my place for a reunion, and none of you will ever, ever see it.” Fallon then erupted into delirious laughter as the audience looked on in confusion. “That’s right! It was all for me! All for me!” the Tonight Show host crowed maniacally, his eyes wide and a vicious grin plastered on his face, “J.D., Turk, Elliot, Dr. Cox, even the janitor—they all came alive once again just for my own personal thrill, and the only person on this Earth who was around to see it was me, only me!” The audience, now in stunned silence, watched as a tyrannical Fallon paraded around the stage, cackling with delight while cruelly regaling viewers with a few details about the heartwarming Scrubs reunion no one will ever see. It sounds like after a few years of hosting The Tonight Show, Jimmy Fallon has become a full-blown supervillain. Throughout the Tonight Show taping, Fallon continued to shriek with laughter as he recounted how the entire cast of Scrubs sat in his living room for the first time in years, reminiscing about the best moments from the beloved sitcom and sharing adorable behind-the-scenes anecdotes, all of which Fallon recorded on his phone and then immediately deleted without uploading even a second to YouTube. Fallon concluded his horrific tirade by gleefully admitting he doesn’t even like Scrubs that much, and has only seen a couple episodes here and there. “I guess I’ll have to check out more of the show now that I’ve reunited the entire cast for the one and only time ever, but probably not,” the host said before stepping offstage amid uproarious boos from the audience, ending the show before any of the planned guests or musical segments. Wow. It’s always a shame to see a popular celebrity transform into a sadistic tyrant, but Fallon seems to be relishing his new role. Let’s hope Jimmy changes his ways in the future and uses his power for good and not for evil.